Wholesale Mix - 1lb. each (SO,BA,BC,BA,LJ,MA,UN,BO,HE,LO) - 10bs. Tumbled Sodalite (Mostly 5/8" - 1") - 1lb. Tumbled Banded/Chevron Amethyst (Mostly 5/8" - 1") - 1lb. Tumbled Blue/Brown Chalcedony (Mostly 5/8" - 1") - 1lb. Tumbled Pink Botswana Agate (Mostly 5/8" - 1") - 1lb. 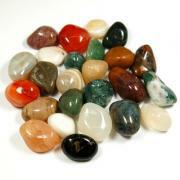 Tumbled Leopardskin Jasper (Mostly 5/8" - 1") - 1lb. Tumbled Moss Agate (Mostly 5/8" - 1") - 1lb. Tumbled Unakite (Mostly 5/8" - 1") - 1lb. Tumbled Black Onyx (Mostly 5/8" - 1") - 1lb. Tumbled Hematite (Mostly 5/8" - 1") - 1lb. Tumbled Lodolite (Inclusion Quartz) (Mostly 5/8" - 1") - 1lb. Purchase our mega-assortment of 10lbs. 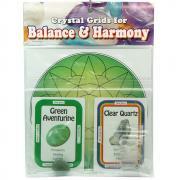 in 10 different stone types or buy 1lb. of any of the stone types listed on this page. Our Wholesale Mix which contains 10lbs. 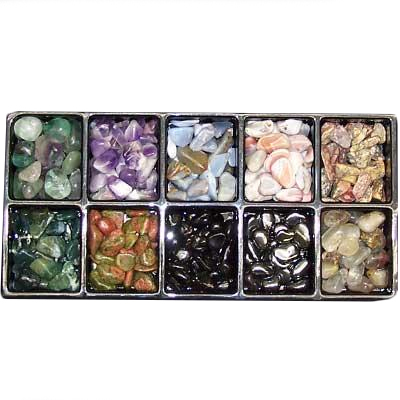 of tumbled stones (1lb. each of 10 different stone types). * Each bag contains 1lb.of one Stone Type. 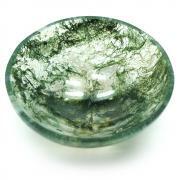 Note: To offer you the best prices possible, we price each Option based upon its average weight and cost of each stone. Affirmation: I live in an abundant world. Question: How do you feel abundant? Affirmation: I am here to flourish. Question: From where do you seek spiritual guidance? Affirmation: My intentions are clear and powerful. Question: Where does your mind go when you daydream? Affirmation: I am a source of inspiration. Question: What forms of healing do you find most helpful for physical ailments? 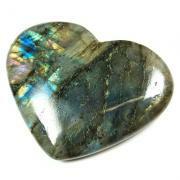 Affirmation: I gently release and heal emotional issues. Question: Do you have any issues that you have repressed which could benefit from being released? Affirmation: I surround myself and others with joy and comfort. Question: What activities to you find bring more peaceful energy into your life? Affirmation: I treat myself and others with gentleness and kindness. Question: Do you enjoy the company of animals? Affirmation: I draw strength from my past experiences. 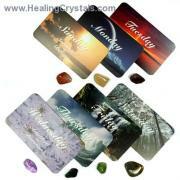 Question: Do you ever feel that your personal energy is drained by certain people, places, or events?